The free range turkey will be the better choice for cooking the perfect turkey for that special holiday or whenever you feel like consuming turkey. This tasty white meat has been made famous by Thanksgiving. And because it's such a big bird, you'll be able to make some great leftover turkey recipes. Turkey nutrition does include being one of the leanest white meats available - especially without the skin. However, I find that the darker fattier pieces of meat are much tastier and so does my mother. Turkey protein is a great source of lean protein and it's known for containing the essential amino acid called tryptophan. This amino acid is involved with the production of serotonin which produces a sense of calmness and helps you sleep. The breast without skin typically only has about 4 grams of fat and the breast meat with skin still only has around 8 grams of fat per 3 to 4 ounce serving. Monounsaturated fat is the main fat found in turkey fat. And turkeys are also lower in fat than most other animal proteins. A turkey must have access to the outside in order to be called a free range turkey. And organic turkeys must be fed organic feed along with being given access to the outdoors. Typically these types of birds are not given hormones or antibiotics like most of the factory farmed turkeys. In other words, the free range turkey and the organic turkey are less likely to mess up your hormones. Beware, free range turkeys can also mean leaving the door open to the outdoors for about 5 minutes each day and organic feed can include soy. 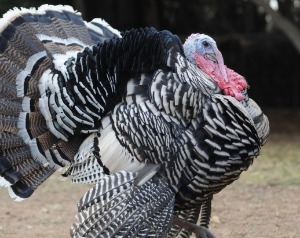 Look for farms that give their free range turkeys ample access to sunshine and pasture. And enough room to move around while indoors - along with a healthy non-GMO diet. 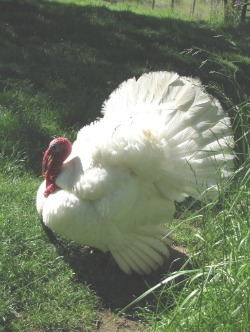 Pastured turkeys are allowed to roam freely in pastures foraging for plant matter, bugs, and grubs in the soil. They are the "real" free range turkey! 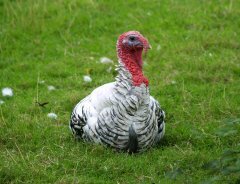 Look for pastured turkeys that are only offered non-GMO supplemental feed. And be sure they aren't being given any antibiotics or growth hormones. 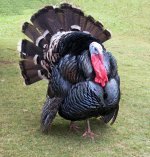 Free range turkeys, organic turkeys, and pastured turkeys that have access to natural pastures will probably offer your body more turkey nutrition. The kosher turkey is treated differently when it comes time to slaughtering the turkey. Kosher foods will have to follow the requirements of the Jewish dietary laws. Slaughtering of the turkey has to be done by someone who is trained to do this type of job as swiftly and humanely as possible. And these big birds are not stunned before they are slaughtered. Also these turkeys do not get soaked in hot water to remove their feathers, only cold water is used. They are then salted or brined and rinsed to draw out any blood. Some say this makes kosher turkeys much more tasty and juicy. The kosher turkey is raised "naturally" and allowed to roam freely in large coops. And you will also find kosher turkeys that are organic. It's best to buy a turkey that has not been frozen for the best results. However, if you buy a frozen turkey be sure to think about defrosting the turkey a few days before cooking the perfect turkey in your oven. There are quick methods such as soaking the turkey in a sink full of water, but slowly defrosting the turkey in your refrigerator is the better way. Put on the bottom of a large roasting pan the sliced onion, carrot, and celery. Unwrap your turkey and rinse it off. Then pat it dry (inside and out) using non-toxic paper towels. Cut off the tail and remove the bag of gizzards along with the neck. Put the turkey in the roasting pan - breast side up. Salt and pepper the turkey cavity. And fold the turkey wings under the bird to prevent burning. Melt butter on medium heat and when it starts to turn golden brown - toss in a handful of fresh herbs. Saute for 60 seconds and no more! Then transfer the herbs into the cavity of the turkey using tongs and tie the turkey legs together using butcher string. Next, brush the entire surface of your turkey with the herb flavored butter. Then season the outside of the turkey. Bake in a 325 degrees F. oven for about 3 1/2 hrs (cook 15 minutes per pound). 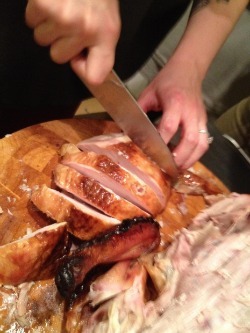 Or until temperature reads 170 to 175 degrees F. in the middle of the turkey thigh (don't touch the bone). Let the turkey rest for 15 to 20 minutes before carving. If you're like me, you usually only have turkey once a year which is a shame because there is so much to make with leftover turkey. Turkey Soup Recipes will show you how to make your own homemade turkey stock from the leftover carcass of your Thanksgiving turkey. You'll also learn how to make a Thai turkey soup recipe for a nice change.